As we set out from the trailhead, we quickly found ourselves absorbed in conversation, catching up on recent adventures and good reads. Crossing the bridge over the outlet of the pond, our conversation died abruptly as we broke out into the open basin. 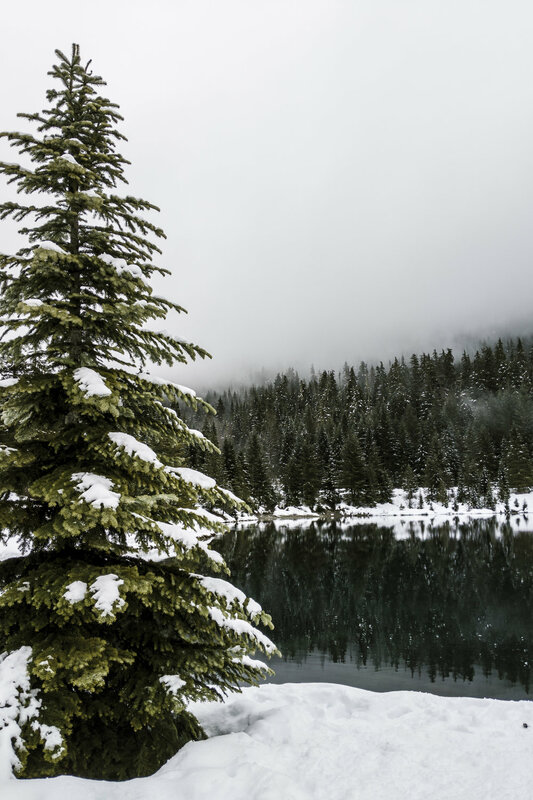 As a group, we stood at the south end of Gold Creek Pond simply staring as the low clouds swirled around the snow dusted trees and rocky ridgelines. Cameras came out and many, many photos were taken. At some point, I managed to tear myself away from the misty magic to rope a very nice stranger into capturing a few group photos for us, then we headed off for our loop around the pond. At the north end of our loop, the ice vanished from the surface of the pond, revealing a vibrant emerald mirror of water. While beautiful, this made the many tracks of footprints from the southern shoreline out onto the extremely thin ice all the more concerning. At least we didn’t see anyone step out onto the melting surface of the pond, but I couldn’t help worrying that others would try to follow in those bootprints! Soon our trail took us away from the pond - and visions of unwary people plunging through the brittle ice - and back to the meandering forest service road. While it was remarkably warm for the season, after our jaunt around the pond the cabin was still a wonderfully welcome sight. Even with such a large group, we quickly settled around the woodstove and into our discussion of our January book - The Bear and the Nightingale. We speculated as to whether or not the cabin might have its own domovoi - one of the quirky household demons from the book. On Ashley’s suggestion, we even had our first book-related game of guessing at the correct pronunciation of the many complicated Russian names and places (batyushka anyone?). All around, the day felt like a hyggelig gathering of old friends, the perfect start to another year of book club adventures!